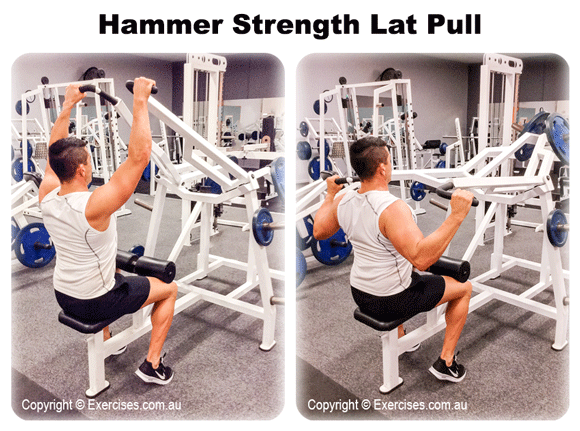 Hammer Strength Lat Pull is a great exercise for building the lats. It also works the upper back, traps, rear shoulders, biceps, forearms and serratus muscles. This exercise is effective in adding size and thickness to your back. It also strengthens the posterior shoulders and upper back to create greater stability and correct imbalances. Take an overhand grip on a Hammer Strength Lat Pull machine. Secure your knees under the pads so that it forms a 90 degree angle to the floor. Keep an arch on your lower back; push your chest out and your feet must be firmly on the floor. Take a deep breath, exhale then with a slight bend on your elbows, pull the handles until your elbows are in line with your hips. Hold the position for a count of “one”. Hammer Strength Lat Pull works best under constant tension. On the top position, do not over extend your arms but instead keep your shoulders squared and your arms bent. Keep your wrists line in with your elbows and do not pull with your biceps. Always maintain the arch in your lower back. 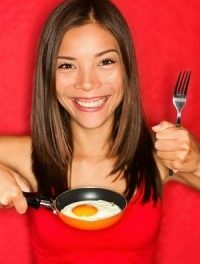 NextHow Much Volume Do You Need In Your Workouts?